Today we’d like to introduce you to Melissa Cricks. Melissa, let’s start with your story. We’d love to hear how you got started and how the journey has been so far. 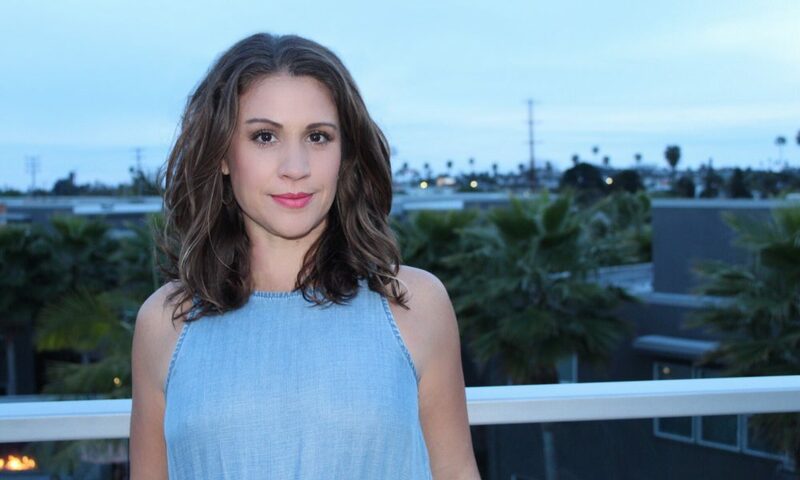 Before coming to LA, I spent my childhood in the sunshine state, my formative years in the Midwest, then, as a young adult, relocated to NYC, where I stayed for over a decade, working my way up the corporate ladder with a career in marketing. But eventually I’d had enough long, cold winters to last me a lifetime, and no matter how many vacations I took, I continued to feel burned out from the fast pace and long hours of the corporate marketing gigs. After my 13th winter in NYC, I had enough of the city life, craved daily sunshine and was ready for a fresh, new chapter. Shortly thereafter I moved to Los Angeles in pursuit of year-round warm weather, frequent beach days, a more active and outdoor lifestyle, and an overall slower pace of life. After my first cross-country road trip, I set up roots in Venice and decided to take a “sabbatical” to re-charge the batteries before searching for a new job. During this work break, I spent a lot of time at the beach and pool, which I found so peaceful and relaxing. Except for one incredibly annoying detail – my beach towel never wanted to stay put! It repeatedly would either slide down my lounge chair, or the wind would have it whipping around, often slapping me in the face while I was trying to read or nap. I found myself trying to find clever ways to keep my towel in place – to no avail. One day I searched online for something to solve this common problem – but much to my surprise, there was only one product out there and let’s just say it wasn’t something that fit my fashion sense (like, not even a little bit)! I asked my fashion-designer friend if she could make me a more fashionable solution, and thankfully she was up for the challenge. The homemade sample wasn’t perfect, but it worked and looked way better than the competitive option, so I was happy to use it at the pool and beach. Then something unexpected happened… my fellow sunbathers kept asking “where did you get that, I need one too!”. Which actually got me thinking about turning this idea into a marketable product! Since I had many years of experience bringing products to market in my corporate roles, I decided to use my business and marketing background to give it a go for myself. From fine-tuning the product concept to a re-design to production, it took 1.5 years and more hours than I’ve ever worked in my life, but I have no doubt it was worth every second of the blood, sweat and tears! Starting my own business hasn’t been a smooth road, there have been many obstacles along the way. The most unexpected obstacle was definitely how much it would cost to start and continue to run this business, which I greatly underestimated. The only way I could afford to support the business was to work a full-time job and run my business on the side (aka “the side hustle”). Since I was working and didn’t have endless free time, it took longer to bring the product to market, but the upside was being able to spread out your bills over time. Please tell us about BandaBeau. 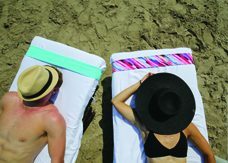 BandaBeau is often described as the beach towel accessory you never knew you needed but can’t live without! 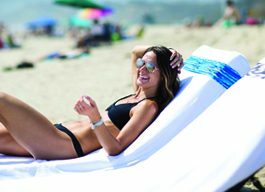 The bandeau bikini-inspired towel band wraps around the top of a lounge chair to keep your beach towel from sliding down or blowing away and claims your seat at a crowded pool or beach resort. 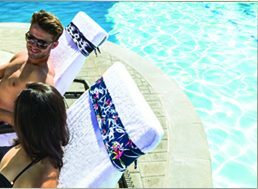 The product is made from a stretchable, swimsuit fabric, is fully-adjustable and comes in a variety of fashionable, vibrant prints & colors that make it easy to spot your chair in a sea of white resort towels. This clever multi-tasker also features a hidden zippered pocket for stashing small valuables like your room key and cell phone, and the pocket conveniently converts to a small travel pouch which makes it easy to toss in your beach bag or carry-on. 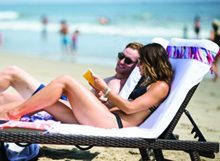 We’re a beach lifestyle brand that provides a more stylish alternative to our only major competitor, and we’re known for our clever design and multi-functional features. 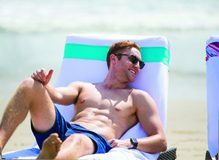 The one-of-a-kind beachside/poolside accessory effortlessly combines fashion with function to set us apart from our utilitarian competitor, while filling a unique void in the beach accessories category. As a first-time business owner, I’m most proud of having the guts and confidence to take what started as a product idea for self-use and turn it into a viable business. Although I had many years of experience bringing products to market, it was always for established, well-known brands and none of the products (none of which were in the fashion category). This was my first opportunity to take a product idea from concept to market, managing all aspects of the launch execution, and all on-going aspects of the business. As the founder and sole employee of BandaBeau, I’ve learned how to wear every hat in a company, which is by far the most rewarding experience of my career. If I had to start over, I wouldn’t have started a full-time grad school program during the same year I launched the business. It’s challenging enough to find time for your side hustle while working a full-time job, let alone while also in grad school. My social life, family time, strict workout regimen and 8 hours per night sleep schedule all took a back seat to make room for the day job, the side hustle and grad school. In hindsight, I would’ve gone to grad school first, then apply those learnings to launching my business the following year. Our collection of 5 vibrant prints and 1 solid is available on www.BandaBeau.com for $29.99 each. Informative interview. Always love to know the person behind the business . Bandabeau is a definite “must” anywhere there’s a towel and a chair .